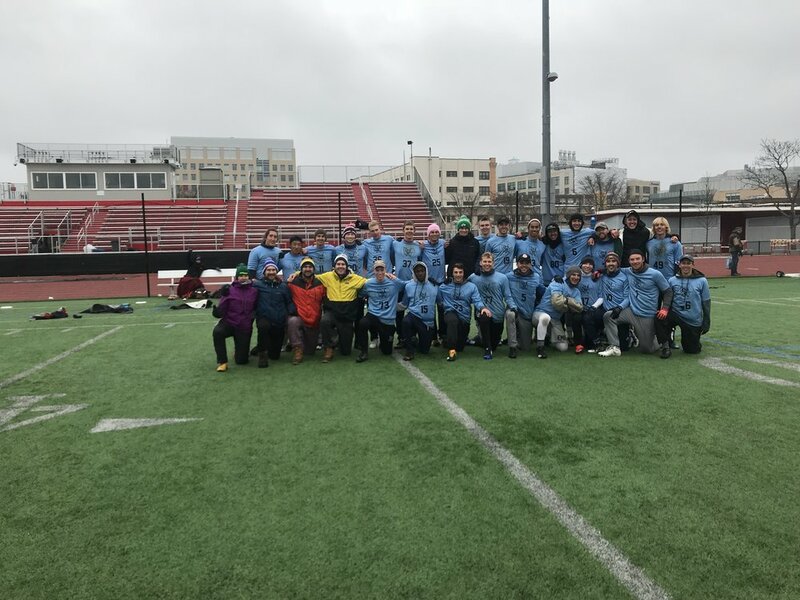 This past weekend, Tufts' A and B teams went a collective 22 - 0 to sweep our respective conferences. The Ewo will be competing at D-I Regionals in Northampton on April 28/29th, and the Emen and Bmen will be competing at D-I Regionals in Amherst on May 5th/6th. The Emen went 5 - 0 with a 13 - 6 victory over Northeastern in the finals. The Ewo went 5 - 0 with an 11 - 6 win over Northeastern in their closest game (round robin format). The Bwo went 6 - 0 with a 7 - 6 victory over Brown (B) in the finals. The Bmen went 6 - 0 with a 10 - 7 victory over Northeastern (B) in the final. Jumbo Magazine, the school's admissions publication, has featured the two ultimate frisbee programs in their latest issue! Head over to this link to take a look at the whole magazine and read the feature. We're on pages 10-11. The Emen stopped by the Ultimate Coaches and Players Conference yesterday to recruit younger players and engage with the community. We had a great time talking with everyone who stopped by our booth and appreciate the hard work of the organizers to put together such a cool event. A noteworthy point about the conference is that 4 of the speakers giving seminars are Tufts Emen alums. Jeff Brown, class of 1990 and long time coach, spoke about using different defensive and offensive looks. John Korber, a frontrunner in the professional ultimate community spoke lectured about preparing individuals and teams for success. Team founder Jim Pistrang introduced his subbing technique and discussed middle school team success. Lastly, current co-captain Gene Buonaccorsi gave insights from his experience as a youth coach in the BUDA Summer Learning League. While Nemo raged in Massachusetts the 2013 Emen hit the fields in sunny Charlotte, North Carolina for our first tournament of the season. Donning extra exclusive jerseys created by none other than Josh Adler (A13) we stepped up to the plate in our first game against Appalachian State. Although we took a solid lead at half we gave up a couple of breaks in a lapse late in the game and ended up winning on cap 12-8. A similar situation would occur in our second game of the day when we again took a capped win this time against Georgia Southern. After a lunch break we stormed through Cincinnati, finally playing a full game before facing the 2 seed in our pool Michigan State. We once again came out strong but frustratingly failed to shut the door, allowing MSU to battle back to a 10-10 tie. We scored to go up as the soft cap sounded and then ran scored the winning break on a high release backhand from Will Wong to Rickshaw. 4-0 on the day. Sunday morning pitted us against our rivals from down the road and emotions ran high on both sides. In an up and down game we struggled early, loosing the disc on a miscue and going down 1-0 on a break. By half we righted the ship to 8-6 on a couple of break of our own. Our inability to put two solid halves together came back to bite us as Harvard capitalized on our mistakes and won 11-8. In consolation play we started off with a 15-2 drubbing of Uconn and finished it off with a solid 15-9 victory over Georgia. Our play on Sunday showed promise as we were able to complete games in a way we hadn't earlier in the weekend. We are posting full game footage from 2012 Nationals over on our Vimeo page. Here are the first two, keep your eyes out for more. I'm still tweaking the conversion settings so the quality isn't optimized yet. We're back. Get on up. 2012 Nationals Highlights from Tufts Ultimate on Vimeo. Sorry for the delay in this recap, I was away from my computer for a while. We came into Nationals this year with the 6 seed, looking to make some noise deep into the tournament. Our path would not be easy, as every team in Boulder was stacked with fierce competitors. Our pool pitted us against Carleton, Colorado, Washington and Cornell. The tournament began for us against a Washington team that we were yet to see in 2012. They came out strong, breaking us on the first point and disrupting our standard offense. We gained our feet a bit more as the first half went on, eventually breaking back and taking half 8-7. However, at the beginning of the second half our offense faltered again -- often turning it over at least once a point and giving up a couple of breaks. As the game went on UW took a 12-11 lead with the soft cap on. Thankfully our defense stepped up and got 2 straight breaks before the Washington offense could score, forcing universe point. Our offense received, marched down the field and scored the game winner on a hammer from Alex Cooper to Jack Hatchett. The second game of the day was against the #3 seed overall Carleton College. We were yet to play them in the 2012 season and were hoping to play spoiler to their top seed in the pool. Unfortunately we got off to a slow start and had trouble slowing down their fast handlers and break side cuts. The offense got broken a couple times and we struggled to maintain cohesion. At half we were down 8-4. The second half was brighter for us as we gained a few breaks back thanks to solid man defense and some athletic plays. Both Jack Hatchett and Carter Thallon shined on the D-line, as Hatchett had multiple run through D's and Thallon had a huge sky over his defender to earn a break. Our run was cut short, however, when Carleton marched down the field on the break side to score the winning goal and take a 15-13 victory. Saturday morning we came out strong and focused against the Cornell Buds. Our offense showed a relentless focus that had been absent the previous day and the D-line continued to generate turnovers and punch in breaks. Sam K-S and Adrian Banerji fueled the offense early on with their sharp, efficient cutting. The D-line cutters moved the disc well and broke a few times to earn an 8-4 halftime score. In the second half we came out and took care of business, working the disc up the break and open sides with ease. 14-7 victory. Our last game of pool play was against the host team, Colorado Mamabird. With seeding going into pre-quarters on the line, we knew we would have to battle to earn the 2 spot in the pool. Piers Macnaughton had a huge game, scoring multiple goals in both halfs and handlers Eric Shaw and Alex Cooper again displayed their pinpoint throws despite a bit of wind. All in all a strong, albeit relatively uneventful game for us -- a 15-9 victory and a #2 spot in the pool. Our pre-quarterfinal matchup was against the University of Texas, a team that we faced early in the season at Centex and played us to universe point. The wind had picked up towards the end of the day, so the game was decidedly upwind-downwind. We faced a lot of zone defense and played a good amount of it ourselves. On O we moved the disc quickly and efficiently throughout the game, regardless of the defense that they showed. Our D-line was tenacious, generating turn over after turn over and never giving up an easy yard. We got a few breaks in the first half going upwind which shifted the energy heavily in our favor. As the game progressed our energy seemed to be endless -- cutters looked fresh and the D-line kept working hard. The crowd fueled us through the windy conditions and Jack Hatchett found Carter Thallon for the 15-9 victory and a bid to Quarterfinals on Sunday. We played the Wisconsin Hodags in the quarterfinals. It was an extremely exciting game filled with breaks, big D's and athletic plays. Sam K-S proved that he is one of the most dominant cutters in the country -- throwing and catching goals left and right. Lloyd Olson wowed everyone with his athletic defense. Cooper, Shaw and Matt Taylor continued to be unphaseable with the disc on offense. The sidelines were clutch, constantly keeping the energy up. In the end, they scored more points than us. We fought hard, we played with pride and we left everything on the field. The experience of being in Boulder with the Tufts Ultimate program this year was incredible. With countless alumni, parents and friends supporting us from the sideline, there was no lack of Emen pride in the air. To step on the field wearing a Tufts jersey made me personally feel like I was a part of something much larger than a group of 22 college dudes. In victory and in defeat, there was pride in representing this amazing program. I can't stress enough how much we appreciate the texts, emails, tweets and words of support that people across the country and the world sent our way. Our performance at Nationals was representative of the strength, passion and dedication of everyone associated with the Tufts Emen. Thank you for following us this year. "Each year the Callahan trophy is presented to the man and woman who combine superior athleticism with outstanding sportsmanship, leadership and dedication to the sport of ultimate. In the eyes of his or her peers, the Callahan winner is the personification of the ideal ultimate player." Not to go all Middle School essay on you, but I thought the definition of the Callahan award would be a good way to start out the post. Superior athleticism, outstanding sportsmanship, leadership, and dedication to the sport of ultimate. This year, Tufts nominates Sam Kittross-Schnell for Callahan, because he embodies all of those aspects, and, in our minds, is the personification of the ideal ultimate player. Superior athleticism - A 6'3 former high-jumper, it would be easy for Sam to only look for deep shots, sky everyone, and not improve his game any more. And when the going gets tough, look for him to make a big play in the endzone. But Sam is more than just a deep goon, it's his overall game that sets him apart. He has the breaks, the mark, the hucks, the in-cuts, the skys, the defense, the endzone cuts, the pulls; he has everything. There are very few, if any, ultimate aspects of the team, where Sam is not in the top few (if not at the top). He is not just a superior athlete, he is a superior ultimate player. Outstanding sportsmanship - There are very few players who are as good as Sam is, while still maintaining good sportsmanship, as people try to get any advantage they can. Sam, however, maintains amazing spirit and is always an exemplary sportsman, showing the utmost respect to both teammates and opponents alike. This is why he was chosen to represent the USA on Junior Worlds, and this is why everyone on Tufts knows that Sam will always make the right call. Leadership - In a faceless army, it is hard to pick out leaders of the team for many more than one specific thing. There are defensive leaders, there are practice leaders, and each section has its authority. However, no matter what Sam is doing, he is being a great leader at it. When he speaks in huddles, every eye is on him, wanting to hear what wisdom he has to say. When he talks about how to do something on offense or defense, everyone wants to hear what he has to say. When he plays disc golf or does a track workout, people instinctively want to join, because Sam is a leader in every sense of the word. Dedication to the sport of ultimate - There are few people that match Sam's pedigree, ultimate-wise. Three time Westerns champion, Junior Worlds player, former player for numerous elite club teams (Sockeye, Ironside), nearly a decade of ultimate playing experience, and numerous other accolades. But that is not the only thing Sam does for ultimate; he coaches, volunteers at ultimate clinics, helps out in running the program, is a certified observer, and does numerous other little things to help the sport of ultimate. His pedigree combined with his helping show that Sam's dedication is matched by none. It is for all these reasons and many more that we are proud to nominate Sam K-S for Callahan. Hopefully the voters will recognize his skills as well. Our first pool play game was against Umass-Dartmouth, a team that we'd seen a few weeks earlier at Metro Boston Conferences and had beaten handily. We came out fired up and rattled off a couple of breaks to go up early. As the first half went on we continued to play with fire, but with some noticeable nerves. A sweet bailout sky by Sam K-S on a bad huck helped us to convert on O and freshman Carter Thallon blew it up on the D-line with multiple layout blocks. In an exciting move that took approximately 3 years off Zalisk's life, Jack Hatchett caught a callahan and spiked it before anyone could determine whether he was actually in the end zone or not. In the end we rolled to a 15-8 victory and a solid start to the weekend. By some coincidence of seeding our very own B-men were the 4 seed in our pool so we stacked up against them in the next game. It makes me proud to say that they played us as tightly if not tighter than the other 2 teams that we faced on Saturday. We took some time to adjust to a certain lanky handler and his thumbers, but our D-line started clicking and we rattled off a few breaks towards the end of the first half. Not much to say about the second half as we took care of business and won it 15-7. Our last game came against Middlebury and for the 10 or so of us who were on the team in 2010 there is still a bit of a rivalry harbored for the Pranksters. Riding the fire of our Juniors and Seniors we came out swinging and broke to 4-0. After giving up a goal we continued to put our foot to the gas and went into half up 8-3. In the second half we continued to grind, despite having a few starters sitting out to nurse injuries for Sunday. We took care of business and ended it with a 15-8 victory. Some notes for the day: Sam Dushay and Josh Adler deserve big props for cutting like maniacs on the D line, Nick Adolph was dropping bomb hucks all day to Robby Perkins-High and the D handlers continued to be one of the the most solid corps in the region. On Sunday morning there was palpable excitement as we all felt ourselves reaching the culmination of months of hard work. We would start the day in Quarters and need to win 3 games en route to the finals. In the quarters we faced UMass-Amherst, a team that had beaten Northeastern on universe point the day before to stay alive in the bracket. The big men ran the show in this game as Sam K-S was nearly unguardable on offense and Dan Pavitt worked hard to shut down their tallest player on defense. Jack Hatchett made some questionable yet exciting decisions with the disc, including a same 1/40th huck to Nick Adolph who laid out for the goal. Robby Perkins-High had a sweet layout D and Alex Cooper almost bid for an errant dump (lets be honest though, he just kind of kneeled). Josh Adler made a sweet grab on a deep huck late in the game to convert a break and Matt Taylor threw a sweet around backhand to Gene Buonaccorsi for the winning goal. 15-9 and into the Semifinals. My personal opinion is that Harvard is always one of the most challenging and rewarding teams to play against. I have a number of positive memories of battling with them over the past couple of years. Sunday at Regionals would be the first time we played them in the 2012 season. As expected they were fired up and ready to battle. Early in the game our D-line secured a few breaks by converting turnovers relentlessly. Will Wong, Nino Figliola and Eric Wilburn did a great job of finding Jack Hatchett and Lloyd Olson downfield and over on the O-line we converted quickly and gave those dudes more chances to break. With the score 8-3 at halftime we came out hoping to take care of business. The offense challenged deep and scored on a few hucks, including a layout grab by Gene Buonaccorsi and another play where Alex Cooper went deep from the handler spot. Towards the end we faltered a bit, giving up a few breaks, but still pulled out the win 15-11. The finals were quite the spectacle. Due to the tournament being on their home turf, the sidelines were crammed with Dartmouth supporters shouting a plethora of cheers. We had our work cut out for us to keep our own energy high. Some great defense on their speedy cutters led to an early break for us and after Eric Shaw made a great deep d we saved our possession after an O line turn. With the score 5-3, they scored a break when on a nice hammer catch, but our D-line got it right back to make it 7-4. Sam K-S made an incredible sky D to save another O point and Alex Cooper, Eric Shaw and Matt Taylor kept breaking through their defensive looks. We took half 8-4 and kept the fire going into the second half. Adrian Banerji made a ridiculous hammer sky for a goal late in the game and Nick Adolph had a sweet layout D on an in cut. With the score 14-9 we came out on defense hoping to lock up the game. After the downfield defenders shut down their cutters, Cenzo Vitiello had a ridiculous layout block on an upline cut. Eric Wilburn picked up the disc and fired an IO to Cenzo who found Jack Hatchett in the end zone for the win. With that goal we won the Region for the first time since 2009 and took a bid to Nationals for the 3rd time in 4 years. - Our womens team, the Ewo, also qualified for Nationals for the second year running. Congrats to them! - We were only losing twice all weekend, when we were down 1-0 and 2-1 to our B team. - In the quarterfinals, the D-line generated 8 turnovers, and scored on 7 of them. - Cenzo Vitiello and Eric Wilburn both returned from injuries to have huge weekends. - This will be Nino Figliola's first Nationals appearance after missing last year's tournament to study abroad in France. - In the past four years the Emen have won both the Regionals tournaments held in Hanover while Harvard has won both the Regionals tournament held in Amherst. The 2012 Emen finished out the regular season at UConn's "Bootycall" tournament, looking to defend our title from last year (when the tournament was called "One Nightstand"). This would be our last chance to tweak our strategies and practice execution before the series. With Sectionals coming up on the 14/15 of April we were looking forward to working hard against some top level Regional competition. On Saturday our pool consisted of games against Wesleyan, UMass, Maryland and Williams, in that order, with the last game of pool play coming on Sunday morning against Boston University. Although we came out a bit slow in this game, our confidence built as time went on. It took us a few points to adjust to a short field and the O-line was forced to work on in cuts leading to goal line dump-swings. The defense was very effective at working upwind, with Nino Figliola and Will Wong keeping the disc moving. A few breaks going into half followed by a few more shortly after half put the game away for the Emen. 15-9 victory. Another slow start for us, as we were broken upwind on the first point and subsequently went down 4-1. Late in the first half we started to find our feet and a huge layout callahan from Freshman Tyler Chan helped us roll into half back up a couple of breaks. Again, the key to this game was discipline with the disc on both offense and defense as the windy conditions made moving upfield a bit tricky. We traded a few points out of half but put in two breaks to finish the game off, 13-9. In the most anticipated game of pool play, we matched up against the University of Maryland Space Bastards and Senior Jack Hatchett's identical twin brother. The first half was a battle until the end when a marathon point ended in a break for the Emen. Maryland was a team that liked the deep ball and Jack Hatchett and co. on the D-line adjusted accordingly. Going into half up 8-6 we were a few execution errors away from a larger margin. In the second half the D-line handlers stood out -- distributing well and working off of each other on turns. Once the disc was in the the hands of the cutters, Robby Perkins-High and Lloyd Olson among others worked hard to keep it moving upfield. The result was a few more breaks and 15-10 victory. In our last game of the day on Saturday we faced Williams, the 2 seed in the pool. Our depth was helpful in this game as we came out fresh despite it being our 4th game of the day. The O-line was efficient thanks to ruthless cutting by Adrian Banerji and Sam K-S, leaving the D-line plenty of opportunities to face the Williams offense. There were a few marathon points, but we did a good job of working hard through them and punching in breaks. Though the score was 8-3 at halftime, Williams was a very hard working team that we knew would not back down. The second half was a bit of a grind for us, as Williams stepped it up a notch, challenging our D-line. They gained a few breaks back, but we closed out and took the game 15-10. Unfortunately BU was unable to make it on Sunday so we took a 5-0 record to the Semifinals on Sunday. Heading into Sunday with a luxurious 1 pm start time, coaches Mike Bright and Jeff Brown emphasized our need to come out fired up against teams that had already had a chance to find their legs. We were set to face Maryland (again) in the Semifinals, who had come off of big wins against UMass and Cornell. In our second matchup of the weekend Maryland came at us hard with swing for the fences offense and solid zone defense. Deep coverage by Jack Hatchett and Alex Cooper was key to stopping the huck and on offense Cooper, Eric "Rickshaw" Shaw and Mike "Iago" Hagenow were patient with the disc, finding ways to break through the cup. Despite a couple of drops and Jack getting roasted deep by his twin, we went into half with an 8-5 lead. In the second half the O-line attempted to cut out the bailout scores that had characterized our first half. Patient cutting and a little more focus helped our efficiency. Again the D-line cutters took over on turns with Tyler Chan, Nick "DH" Adolph and Dan Pavitt all making solid plays to keep the disc moving upfield. The breaks started to come and we took a 14-7 victory and bid to the finals. The finals would be our last chance to perform in the regular season and it was a high energy, big play game against a tall, skilled UConn team. Breaks came back and forth a few times in the first half, as the O-line cutters did well to get open, but gave the disc up a few times on miscommunications and drops. The UConn defense did not give the disc back easily and demanded that our O-line work hard to regain possession. The D-line did an excellent job of generating turns thanks to Will Wong's relentless mark and Jack and Lloyd's deep coverage. Nino again shined as a handler on the turn, often complemented by Rickshaw or Cooper. A break heading into half gave us an 8-7 lead. Energy was the name of the game coming out of the break and we finally tightened the screws on offense. Piers Macnaughton was unstoppable in the cutting lanes and Cooper again wowed fans and opponents alike with his arsenal of throws. Though UConn was an extremely talented and hard-working team, our fire and execution helped us to a 15-10 victory to defend our title. Check out a video of our game winning break at the bottom of the post. A big thanks goes out to all the parents who came this weekend to feed us and cheer us on. Also, shout out to Nate "Noodles" Tenczar and Ryan "Irish Creme" Bailey for coming out to film for us. Edit: Gene never toots his own horn in his recaps, but his steady presence and strong cutting were essential to the success of our offensive line all weekend. Freshman Carter Thallon's fantastic work rate on both sides of the disc stood out this weekend as well. We came in seeded 1st overall, in a pool with North Carolina - Wilmington, Virginia, Penn State and Cinncinnati. Conditions on Saturday were rough to say the least. The temperature hovered around 40 degrees for most of the day, but felt much colder due to wind chill. Weather reports said that winds reached 40 mph at times on Saturday, never really dropping below 20 mph. The impact of the gusts was felt in pool play games. In the first game against Cinncinnati it took a while to find our feet, but we pushed through and got a few breaks late in the first half. Although we took the lead, we had some trouble defending against their huck and play D mentality causing a closer game than we had hoped. In the end we pulled out a 10-8 win and looked forward to the next game against Virginia. Facing last years National qualifiers out of the Atlantic Coast region, we came out a bit stronger. The offense started to click and the D stepped up and generated turn after turn. Again we battled through the wind for a few breaks and took the game 10-6. After a lunch time bye we faced Penn State, with the wind still whipping. Our opponents relied heavily on a zone D, which handlers Alex Cooper and Eric Shaw made quick work of. On defense we shut down their cutters early and made strong use of the turnovers we generated en route to a 13-5 victory. Our final game of the day pitted us against the #2 seed in our pool UNC-W. With winds blowing as strong as they had all day, the game became an upwind downwind battle. UNC-W broke twice out of the gate and we never were able to climb back, losing 9-7 on the hard cap. We ended the day on Saturday with a 3-1 record, placed second in our pool. We started Sunday bright and early with a pre-quarters match up against North Carolina State. The weather looked to be a little bit more co-operative on the second day, with winds coming down to a tamer 15ish mph. Though the morning was chilly, as the day progressed it warmed up a bit, mimicking conditions that we will likely see come series time in New England. In the Pre-Quarters match up we came out with precision and intensity that we had struggled to find on Saturday. Nick Adolph started the day off with a layout D and the tenacity continued from there as the D-line ran off break after break against NC State. Downfield defense was excellent and patience with the disc was the name of the game as we rolled to a 12-3 victory. In the Quarterfinals we faced Regional rivals Dartmouth for the first of what will likely be a number of matchups this spring. As always it was a hard fought game against Pain Train. We traded early as both teams tried to establish offensive consistency and aggressive defense. Dartmouth got the first upwind break midway through the first half on a series of upline cuts but our offense answered back and put the defense back on the field. Things started to click and late in the first half the D-line strung together a chain of breaks to give us an 8-5 lead. In the second half we continued to pressure their offense, while converting our opportunities on with the disc. We managed to push through another break, although they broke back to end the game. When the hard cap went off the result was a 14-11 victory and a trip to the Semifinals. In the Semifinals we faced off against Ohio Valley contenders Ohio University, who had battled by Michigan in their Quarterfinal matchup. In a minor twist, our field location changed to a less protected field that was much more susceptible to the wind. Though the change was not a huge factor, both teams had to adjust their styles a bit to fit the weather. Ohio was a very fast team that moved the disc quickly and precisely. On defense they ran a tight zone to pressure our handlers, coupled with a few points of man defense. We traded early in the first half with both teams doing a good job of valuing the disc on offense. Our D-line began to generate turns, however, thanks to solid marks and lock down cutter D from Jack Hatchett, Robby Perkins-High and company. Our combination of offensive consistency and defensive intensity proved to be too much for Ohio as the first half went on, leading to an 8-4 Tufts lead at halftime. In the second half Ohio started to click on offense a bit, utilizing their deep game to score a few points. At the same time our offense continued to handle their defensive looks, working the disc down to the goal line and hitting the open looks in the end zone. After trading points for a while, the D-line grabbed another break, and the hard cap horn went off soon after. The final score was 14-8. In the finals we got the opportunity to avenge our loss to UNC-W from the day before. With winds at a much tamer level the game would prove to be a much more skilled affair than the previous matchup, with both teams running consistent offensive looks rather than hucking downwind and playing defense. Though both teams had a bit of trouble taking care of the disc early in the game, we traded points to start the first half. It would be our D-line that would put up the first breaks. Will Wong and Eric Wilburn anchored a patient handling corp and Cenzo Vitiello and Lloyd Olson worked hard to keep the disc moving downfield. By making the most of the turnovers that our defenders generated we were able to establish an 8-3 halftime lead. In the second half we traded points up to 10-6, at which point UNC-W got their first and only break of the game. From then on out it was all Tufts as the offense held on the ensuing point and the D-line ran off 4 breaks. Nick Adolph and Carter Thallon played great man defense down the stretch and, as always, Piers Macnaughton defied all laws of physics when making plays downfield on offense. After Will Wong called a timeout on the goal line Lloyd Olson broke free to the cone for the winning break. The final score was 15-7. After the game Piers Macnaughton was awarded the Skyd Magazine MVP award by No Look Scoober's Bryan Jones. All in all it was a solid weekend, highlighted by great play on both sides of the disc on Sunday. Although the conditions were challenging on Saturday we stuck it through and played Tufts Ultimate, improving every step of the way. Now it's back indoors to prepare for Centex and Easterns in mid-March. As Ultimate players from New England, we all know the drill when it comes to the winter season. You run on indoor tracks, lift weights, throw on basketball courts and dream of the sunny days during which you can actually lace up your cleats and feel the grass. As a college player I think that winter break is one of the biggest challenges that the season holds. After the exhilaration of creating the foundation for the team comes the strange feeling of being detached from your new teammates and your school. While my personal experiences with winter break have always been a little bit frustrating (as is expected), I've never felt a considerable road block when working out alone. This year is going to be a bit more of a challenge for me. During the fall my formerly independent training habits changed, and I found myself gravitating towards my teammates when it came time to hit the gym. Now I am facing a winter season where I'm flying solo for the most part again. This undertaking has led me to consider how winter break shapes the individual. While there are multiple ways to think about how winter affects us (strength training, injury recovery, etc), I think that the independent perseverance that winter training relies on is hard to ignore. The autonomy that we (ideally) foster during the "pre-season" can pay significant dividends later. As non-varsity college athletes, we all have different schedules and don't have the luxury of meeting up with each other 5 to 6 days a week . Therefore, at least part of our training relies on our own ability to initiate action. Winter is a chance to build this skill. If we, as players, can successfully put in the solo time while not at school, then it will come naturally when we need to function semi-independently in the spring. In past years I have thought about my winter training as a physical preparation for the coming season, but the ability to mentally prepare is becoming more apparent to me this year. Just a thought that's been in my head as the winter begins. Happy holidays. We've started making our Spring Schedule, and it looks like we'll be getting some great competition in early and often. In addition to our regular practice and workout schedule, we have a few tournaments lined up. After that, we'll probably play in one local tournament (eg. Yale Cup, New England Open) and then we'll have the series. Get psyched Tufts, it's going to be a fun season. This morning, 19 E-men went over to Mike Boyle Strength and Conditioning in Haverhill, MA to work with the legendary Tim Morrill. After some brief introductions and talking about ultimate training, we got into warm ups. A bit of foam rolling and a few plyos later, and we began to hit the weights. We learned some basics about cleans, and listened to some killer jams while practicing form, until nearly everyone could set up when Tim shouted out. Next up, single leg squats, all together. We had learned this one before thanks to DH and JTT, but getting that low was a bit of a shock to the system for us all. For our final sets, we did two tri-sets of three workouts, with everyone working hard to get their swell on. Once we finished that, Tim had a bit of a treat for us, as we plowed through the gym with sleds, going for speed and for power. It was nearly everyone's favorite part of the day, and though one team won the race, everyone won for fun. After the sleds, we talked a bit more, thanked Tim for his help, and gave him a dank fresh new disc. If I were a betting man, I'd wager on us seeing quite a bit more of him this upcoming season, as we try to increase the athleticism of the team. Big up to Tim and his ultimate workouts; you all should check out his facebook, twitter, or youtube to see some of the stuff we did. The dude's an expert, and it was awesome working with him. Quite the day to see the squids in the weight room, but it was awesome working out with the other dudes who are psyched for the upcoming season.